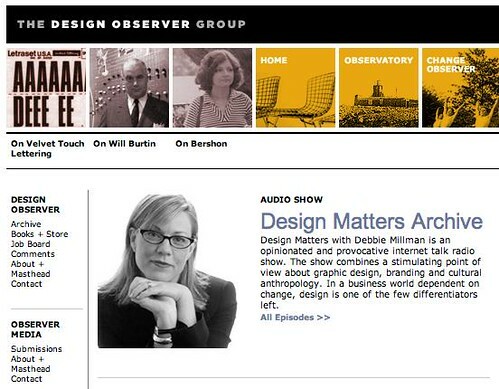 debbie millman: Design Matters Archive now available on Design Observer! There's an error in the the link to the Observer Media channel. It should only have one "h" in http. Thank you, I just fixed it! Wow, excited about the changes here and the new book! Looking forward to more Debbie. Can't wait to see what Byrony and Armit generate. Please take a peek at this for Video Streaming. Would be great to have your live interviews video streamed live! UStream Watershed. You can see how Andrew Werner is using it here: Mixergy A fellow you should interview... after me! very excited about the book debbie! Can't wait to pick it up.